This week is Earth Science week! At NASA, we have a great group of scientists who strive to understand our planet, research ways to make it stay beautiful, and moreover, ensure it remains that way for generations to come. To celebrate, we have interviewed three people who vary in background. Their expertises range from performing the science to deveoping ways to share science with the next generation. We will post each story during the week to learn more about what Earth scientists do and share in their passion and curiosity. 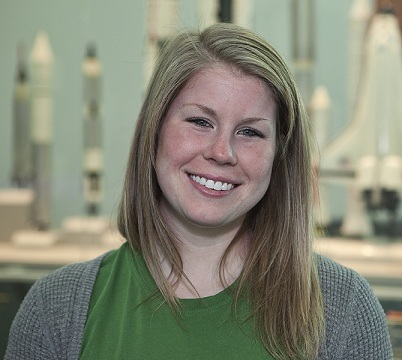 Today, let us introduce to you Sarah Crecelius from NASA Langley Research Center. We hope you enjoy the interviews and are intrigued by their stories. One never knows when the spark happens! Read more stories and learn more about the celebration at http://women.nasa.gov/earthexplorers. I am an Outreach Coordinator for the Student Cloud Observations On-Line (S’COOL) and MY NASA DATA (MND) Projects in the Science Directorate at NASA Langley Research Center. I recall that on my first day I was proud, excited, and nervous. How did you discover your passion for Earth Science? I grew up camping and taking yearly trips to Algonquin Provincial Park in Ontario, Canada. I have always loved being outdoors and learning how nature and weather work, but I really discovered that I was passionate for Earth Science when I saw a tornado on the weather channel. From that moment, on I wanted to understand how weather and Earth systems worked together to form such a colossal and powerful force. My passion continued to grow in college as I majored in atmospheric science and minored in natural resource management. I realized that understanding the Earth and her systems can help us/mankind understand best management practices and inspire further research of our planet. I have had many inspirations that have guided me down the path that I am on today, but the first was in elementary school. I attended a math and science magnet school that provided a Battel Scientist once a week to help the class with a science experiment. Dr. Phil Sticksel inspired each one of his students to always look for the next question. I learned science because I was the one doing it. In high school, I always liked the algorithms and equations of math, but science (physics and chemistry especially) helped me apply real world applications and understand the algorithm or equation. It was in college that I realized being a woman in the science field was a unique position. It was a great opportunity and experience. Professors and colleagues fostered an atmosphere of respect and learning that expanded my horizons and understanding of real life science. I was proud to gradate as one of four women in my atmospheric science program. What are some of the most important lessons you have learned in your life? · Everything isn’t always what you expect. · Be prepared for whatever comes your way. · Work well with others, stay open minded, and listen. · People have as much right to their opinion as you do. · Network! Find a champion (someone who also wants to see you do well and succeed). · Find a role model (it’s easy to reflect on others’ good acts for examples when you have trouble with your own). · Work your hardest, and you can leave knowing you gave all you had. These are the usual motivational sparks. If you can remember them during the day, you’ll have a pretty good guide to success and happiness. What was the most difficult moment of your career? What did you learn? While still early in my career, I have had difficult moments. Learning to work with a team of non-like-minded people and follow processes that have been in place for years was a struggle in the beginning. I have learned that different views and processes provide experience and wisdom and if it’s worth changing something, my argument/ideas need to be stable and unbiased. Another difficulty I face as a young professional is doubting my ability (compared to those around me). I have learned that everyone has off days and that if I trust in my abilities and knowledge, I am well suited for the work I do. Who has been the biggest influence on your life, and what lessons did they teach you? My parents, my mother, and Dr. Sticksel have made the biggest influence on my life. Each one in his/her own way has always taught me to try my hardest, never stop asking questions, and by-pass the road blocks. My parents have always motivated me to strive for my best while supporting me. My mother is a perfect example of a successful woman, wife, and mother. Dr. Sticksel sparked the fire that has turned into a love for science. His passion for the science has shown me that if you love what you are doing, the reward is endless. What one piece of advice would you like to pass on to the next generation? Find a STEM (science, technology, engineering, and math) career that works for you. It doesn’t have to be literally these things, but find your passion and see what’s available. It can be easy to see science in the world around us (photosynthesis, weather, climate, plants, animals), but to experience science is to understand/want to understand the world around you.